Today we share with you a report about the revolutionary and innovative task of "bring back" the Yamuna to Keshi Ghat. Since the early beginning of December 2011, Chandi Heffner and K.P.S. Gill began a groundbreaking work in Sri Vrindavan Dham to "bring back" the Yamuna to Keshi Ghat. Until then, all that came to the shores of Ghat was water from the city drains that flow along the Yamuna. 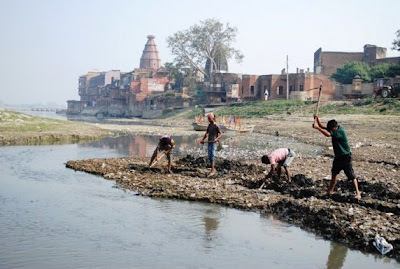 The water became so dirty that while the famous puja at the Yamuna was made, in front of the pilgrims there were just a lot of waste, sewage and plastic garbage. 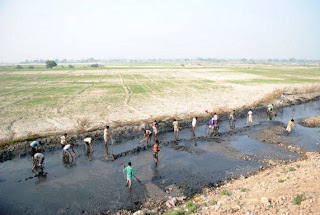 It is in this context, that the two mentioned above, began to dig a small canal that would ideally fresh water from the Yamuna and clean up all waste accumulated in such an important place. The channel was launched with blades of about 30 workers, who did not imagine the impact of their efforts; they dug for more than a week determined by the project. Workers digging the canal - Jugal Kishor Mandir and Keshi Ghat at the background. Enthusiastic collaborators joined the cause, even a group of over 50 students of Sandipani Muni School along with other organizations and mandires supported the excavation in its beginning, however, Chandi Heffner, K.P.S. Gill and their people were the ones who continued to work until today. Volunteers who participated in the beginning of the channel. The moment when Yamuna's water began to run down the narrow channel; it was undoubtedly historic and filled with joy all the ones present there. The water begins to pass through the canal - its quality was still very dirty. The quality of water passing through this channel was not very good, but as it became more wide, water's appearance became more clear. With the passage of time, it began to increase the number of workers who were doing this channel bigger and bigger. Workers finishing their work at sunset. At its peak, the number of workers reached 500 people, who during the whole day (despite the cold and fog of winter) very strongly engaged in this excavation to allow Yamuna Devi came with greater force. It was not just workers, but devotees and Yamunaji's agents directing Her way to Keshi Ghat. Overview of the process of digging the canal in the early moments. 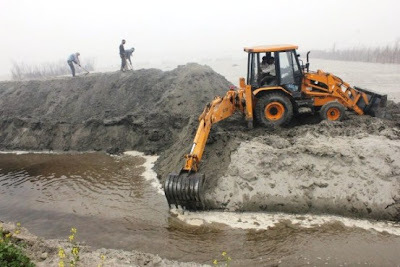 Gradually, it began to be required greater impact at work, and it was at that time when a bulldozer began to work day and night, removing the sand from the road and allowing Yamuna Devi had more space to flow. Backhoe machine doing the channel wider. Origin of the channel, up to Imlitala Mandir - in the background: Yamuna water entering through it. At the same time, in the Yamuna at the height of Imlitala Mandir, a dam (made from sand bags) was begun to allow the entire runway to go through the new channel. Overview of the dam at first - the ground was half a meter above the surface of the river. The "army builder" of the dam. The dam was getting taller and wider every day. The observers could see hundreds of people moving like ants, carrying sacks of sand from one side to another. Advancing in the construction of the dam. Group of workers filling bags of sand. Bags ready to be picked and placed in the dam. While one group fed the dam with bags, the other was busy filling them with sand. The picture was like being witnessing the lila of Sri Hanuman and his army building the bridge to Sri Lanka. The dam under development - the ground was already more than one meter above the surface of the Yamuna. Every day hundreds of workers were responsible for increasing the height of the dam. Overview of the dam and its workers. The hardest job was to close the dam and it was succeeded on the first days of February. For nearly a month workers were "fighting" against the strong current of Yamuna Devi to lead its full watercourse to Keshi Ghat. The space between the two sides were not more than three meters, but the strong current prevented the closure of the dam. Current of the Yamuna in the middle of the dam. Several attempts to close the dam with large wooden sticks. Finally, on February 1st, the dam was closed completely. Large nets filled with sandbags allowed the Yamuna's watercourse be directed completely towards Keshi Ghat. At present those sandbags are acting as a filter for water, thus Yamuna Ji is flowing clearer. 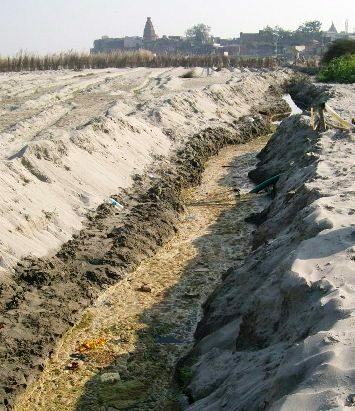 View of the current channel to the height of Imlitala Mandir - the arriving water is much cleaner. View of the channel from Keshi Ghat - all this space once was just sand and sewage. The bridge constructed of sandbags has become increasingly broad and firm and now work has focused on clearing the land and organized the "mountains of sand" which had been formed due to the opening of the channel. Bulldozers clearing and leveling the ground. The outlook for these spring days is very sweet and friendly; thus many different bird species have begun to appear on the banks of Yamuna, becoming it a true sanctuary. At the same time, the pilgrims who come to the banks of the canal take darshan and bathing in what was once just sand. The banks of the Yamuna have been converted back into a bird sanctuary. Different species have settled in the place. The wind blows softly as Yamunaji flows with force directly to Keshi Ghat; in the meantime the bulldozers continue their work of clearing the land. The space which formerly was sand mixed with wastewater now has welcomed pilgrims who come to take darshan of Yamuna Devi. Nowadays, Yamuna Devi is flowing much closer to the Parikrama Marg and sometimes She comes right on the shores of it. This is of great impact, as it allows that the possibility of the river coming back to the original Ghats becomes more real. View of the Yamuna in front of Jai Singh Ghera - water touches the edge of the path of Parikram. Actually, all this service to Yamunaji is historic; an amazing effort that no doubt leads to more work in the future. 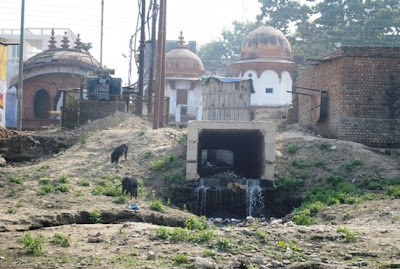 The Yamuna water is coming closer to the temples that are in the way of Parikrama. At the background we can see the Mandir Imlitala's domes. View of Yamuna from Keshi Ghat - even the pillars of the "unfinished bridge" were submerged. Much remains to be done on the treatment of sewage from Vrindavan and finally stop their way to the river; lots of service to be done to create an efficient waste cleaning and treatment, lots of efforts to make that many people - both the permanent people and pilgrims with their heart in Vrindavan - become part of the task of maintaining the Dham clean and protected. That is the service, which for mercy, has reached each of us. Channel Digging at Keshi Ghat, ki jay !!! Vrindavan Dham, ki jay !! !